Develop better behavior management strategies in schools. 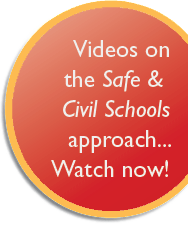 Learn effective classroom management procedures. Implement schoolwide Positive Behavior Support and Response-to-Intervention for Behavior. Design and implement a better school improvement plan. We can help you foster respect and responsibility in your students and improve school climate and school culture. Train your entire staff to make data-driven decisions on a schoolwide level, in classrooms, and with individual students. Learn how to develop proactive, positive behavior support strategies tailored to your classroom, school, and district. Building on over 30 years of experience, Randy Sprick and associates refine decades of research on effective teaching methods into practical, easy-to-use principles and procedures. Our staff development has helped school districts throughout North America build the knowledge base needed to create positive school environments that are emotionally and physically safe and that foster independence, integrity, confidence, self-control, kindness, and responsibility. Explore our web site to learn how our workshops and inservice trainings, consultation, books, and DVDs result in outstanding professional development for K-12 educators. Then, contact us to learn how we can help! Working together we can make a positive difference in your school!